We currently offer computer programming tutorials for Microsoft Small Basic, Microsoft Visual Basic, Microsoft Visual C#, and Unity C#. 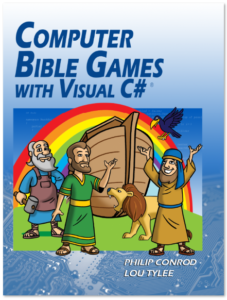 The Computer Bible Games For Microsoft Small Basic Programming Track is designed for students starting at 10 years of age and above. 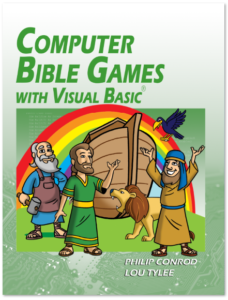 Our Computer Bible Games with Visual Basic is designed for middle school and high school. Our Visual C# Tutorials are best for high school students or possibly students middle school students who love programming. 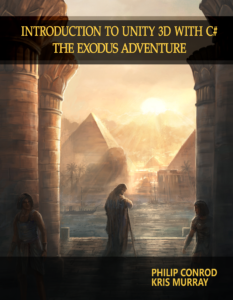 Our newest tutorial, Introduction to Unity with C#: The Exodus Adventure, can be taken after a high school student completes our Computer Bible Games with Visual C# Tutorial. So where should your student start? 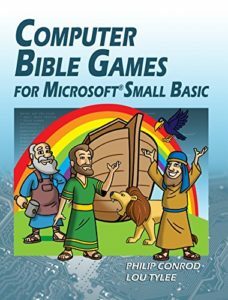 If you or your student have no previous computer programming experience, we highly recommend you start with our Computer Bible Games For Microsoft Small Basic” programming tutorial for beginners. If you personally have programming experience with Visual Basic or Visual C# and you want to provide some personal coaching and guidance to your student along the way, we suggest you pick the computer language you are most familiar with. If you and your student are both new to computer programming, just start with the Computer Bible Games For Microsoft Small Basic textbook below. It requires zero programming experience on the part of the parent or student! Once your student has successfully completed our Computer Bible Games For Microsoft Small Basic tutorial they can easily move right into any of the other Programming Language tutorials like Visual Basic or Visual C#. If your student is really interested in learning 3D Adventure Game Programming we now offer a Unity 3D C# Game programming tutorial. All of our tutorials are self-paced and self-study so they are designed for “parent-friendly” independent learning. Students ages 10 – 12 may need some assistance with advanced math concepts like square roots.​ So with that introduction, let’s review each of our “parent-friendly” self-study computer programming tutorials in more detail. COMPUTER BIBLE GAMES FOR MICROSOFT SMALL BASIC is a self-paced “beginner” programming tutorial. This tutorial consists of 13 chapters explaining (in simple, easy-to-follow terms) how to build Computer Bible Games in Microsoft’s Small Basic programming language for beginners. Appropriate For 5th-12th Grade students (and adults!). COMPUTER BIBLE GAMES WITH VISUAL BASIC® is a self-paced semester long self-study “beginner” programming tutorial consisting of 13 chapters explaining (in simple, easy-to-follow terms) how to build a Visual Basic Windows application and Computer Bible Games. Appropriate For 7th-12th Grade students (and adults!). Introduction to Unity 3D using C# is a semester long self-paced “intermediate” programming tutorial consisting of 17 chapters explaining how to build a Unity® 3D Computer Bible Adventure Game surrounding the events of the Exodus. This Tutorial requires a some previous exposure to the Visual C# programming language. Our COMPUTER BIBLE GAME WITH VISUAL C# would help your student gain that exposure. Appropriate For 9th-12th Grade students (and adults! ).